Your kitchens backsplash should be so much more than just a splatter guard. These new popular kitchen backsplash trends can echo the warmth of the desert, add color and depth to a muted space, and even stand in as permanent art for your guests to ponder and envy. Creative kitchen backsplash styles are using classic shapes in new, surprising ways, embracing color in a market of neutrals, and creating interest at even the smallest price points. CAD Pro helps you plan and complete any type of kitchen design plans with intuitive smart floor plan tools and kitchen design symbols. Share your kitchen backsplash plans with clients or contractors using Dropbox®, Google Drive™, OneDrive®, and SharePoint®. Export files to Microsoft Word®, Excel®, and PowerPoint® with a single click. One of the neutral kitchen backsplash styles are always on trend and they’re a safe bet for resale. But there’s one neutral color story is rising above the rest, dominating the design world at large. Homeowners are seeing a huge favor for what is called “Shades of the Desert”. Anything that falls into that terra cotta or sandy color is following on the heels of the brass trend. People are going for these warmer color tones. The palette can really stand out with certain shapes, like star and cross tile. The star and cross shape has been trending as one of the popular kitchen backsplash trends for the last year, especially when paired with those warmer desert hues. A colorful backsplash can breathe energy into your daily routine, from your morning coffee to your weekend meal prep. It’s also a great way to bring designer appeal to your kitchen. Designers and homeowners are really embracing kitchen backsplash styles with saturated colors. This trend leans towards more dramatic but classic colors. Lovely saturated green shades along with some deep colors like navy blue. And flagstone is another good one that has an earthy quality. Basic black and white tile can add classic, yet inspiring flare to your kitchen backsplash. Among the popular hand-painted tile collections, the black and white collection is definitely one of the most popular kitchen backsplash trends. It’s a nice option where you get that pattern and the texture, but it feels a little bit more classic. A backsplash is a perfect opportunity to introduce contrast to the kitchen. We see super neutral kitchens, where there’s a blonde wood and lighter countertops, with a beautiful, earthy green backsplash. And we also see the opposite, where people do these lovely colorful painted cabinets and the backsplash is a super simple glaze, like a shade of white. You can also create contrast by pairing opposite finishes. When you have a high-gloss backsplash paired next to super matte countertops or cabinetry, the colors are going to pull everything together, but the sheen contrast is going to let each element have its moment and adds contrast for these kitchen backsplash styles. Classic shapes and styles are often underestimated. They’re some of the most affordable. And once you have them, you can get creative and move beyond the simple horizontal subway pattern. We always try to remind people of the design possibilities with something as simple as a square or a rectangle. You will see plenty of subway tile installations, but more often we’re seeing rectangular tile installed in a straight back pattern or what we call a soldier stack. Hexagons are one of the very popular kitchen backsplash trends and it’s always a classic favorite. When you plan your installation, consider whether you’d like the look of a full-height backsplash. A lot of people think backsplash and they think, ‘I’m just going to put this tile from my countertop to my upper cabinets. But, if they have the space and it makes sense, a lot of times we see people go full height with tile. This is a smart move to make from the start. If you don’t do it now and you change your mind later, it’ll be harder to match another batch of tile to your original installation. Feeling inspired beyond your budget when choosing your kitchen backsplash styles? Even a little bit of tile can go a long way, and you can get a gorgeous hand-painted backsplash at a comfortable price point. There’s a lot of beautiful things you can do with less tile. You don’t have to go full tilt. You can do shorter backsplashes, do the wall that has your stove on it or a clean strip of tile behind the stove. And maybe a standard four-inch splash that runs around the rest of the countertop. One final word of caution: Don’t skimp or cut corners on your kitchen designs. Make sure the kitchen design plans spell out every detail, so it doesn’t confuse those involved. 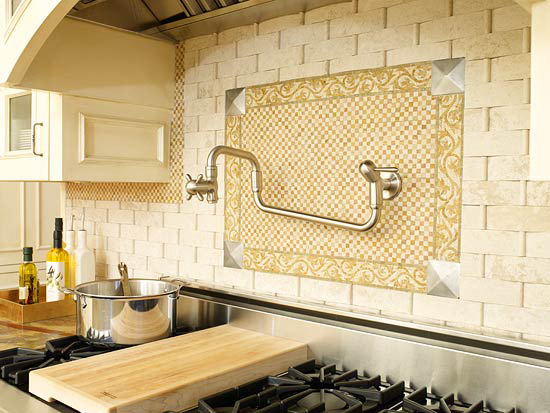 Proper planning often cuts down on the length of a backsplash job by 30 percent. Good plans can also reduce cost overruns and surprises. CAD Pro has helped thousands of remodeling professionals, builders and contractors plan and design all types of kitchen projects. CAD Pro is used by NHBA builders and contractors. Cad Pro is an affordable and easy alternative to other more expensive CAD software programs. Cad Pro is great for creating custom home plans, building plans, office plans, construction details, and much more. This entry was posted on January 22, 2019 by Home Pro News.